Our ace reporter in the field, SueC, has filed this report with ONBC about sightings of Peter Pan, Wendy, Tinkerbell, fairies, pirates and Indians in Kensington Gardens! The day began as they usually do at the start of a trip: with me oversleeping. This is a time-honoured tradition in my family. Over the years, we have missed a number of planes, trains and ferries. It’s not that we don’t set the alarm, more that we switch it off while still in a sleep-befuddled state, only to awaken some time later with a Mort-like start. This day was no exception. My friend phoned me at 7.00 a.m., some fifteen minutes after I should have arrived at her house. I moved like the wind in the optimistic belief that we could still make the 7.45 train, but of course, the notion was ridiculous. Happily, my friend, Suse, is quite used to me, having gone on vacation with me before and merely said resignedly that she couldn’t understand why she had thought today would be any different. Her son drove us to the station (Birmingham New Street) where we tried to make up for the poor start to the day by consuming vast amounts of tea and upgrading to First Class on the train. We arrived in London feeling Rather Worried About The Weather. The streets were still damp from the rain and we have known it rain stair rods on us on previous outings. Happily, the sun came out and it grew warmer and brighter throughout the day. We headed off to the Underground. When we emerged at Lancaster Gate station, it was obvious we were in the right place as we followed little Tinker Bells and pirates up the stairs and into the street. 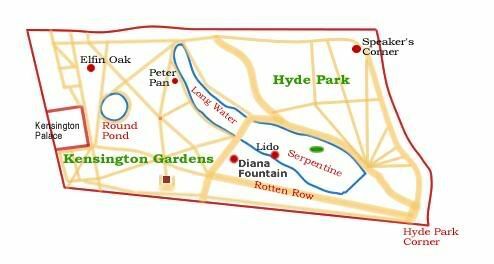 The Neverland ‘Do’ was in Kensington Gardens. We set off at a brisk pace across it - which is to say, quite slowly. (Bear in mind, please, a very poor level of fitness after being laid up for some months.) So, some time later, we arrived just in time at the queue for the picnic. We were presented with our hamper, some postcards and a treasure map and we settled in the Picnic Area. Now, this may imply facilities, such as tables and chairs. In reality, there was nothing of the sort. We sat down on our waterproofs and set to. It was great fun, I must say. We were treated to an array of characters as they strolled past or performed for us: Edwardian policemen and nannies; jugglers; and some rather strange looking creatures in lycra and masks and on stilts. At various points, pirates darted among us fighting among themselves and with the children. Then Peter Pan and Wendy appeared, with him begging the children around to come and help him rescue Wendy. They were actors from the Cambridge University Amateur Dramatic Company. I missed all the best photo opportunities but caught up with them later for a posed shot. They were very pleased when I explained that it was wanted for the ONBC. After lunch, we wandered about looking at the attractions. These were definitely aimed at the small children. They included things like slides and fairground events such as chairoplanes. They also had an Edwardian feel. There was a coconut stall and a Punch and Judy stand (a puppet show), which I did not linger at to watch. No, not even for the ONBC am I prepared to watch Punch and Judy! Next were Hook’s Galleon and the Pirates Camp by the Round Pond, suitably decorated with a bunch of skeletons. It was a lovely incongruous scene, with Kensington Palace in the distance across the pond. It was quite lively too, with the ‘pirates’ teaching some of the children self-defence and stage combat skills. I found myself thinking of my oldest nephew here, who would have loved it. He is five and into pirates in a big way since watching POTC this Easter. Last week when I saw him, he asked me if I liked playing with Barbie or doing boys’ stuff such as pirates. Hmm. Tough choice. I assured him with a perfectly straight face that I always love playing with pirates! I paid for the remark though, by spending the next hour hunting for treasure while being bossed around by a five-year-old with a hook for a hand! I had toyed with the idea of taking him but I’m glad we didn’t, as he would have found the train journey very trying (over two hours). We found the Fairies’ Winter Palace next. Outside this tent was another show: this time where various performers were getting some of the children in the audience up and involved in acting out various bits and pieces in an ‘interactive journey to Neverland’. Then we headed off to look at the Lost Boys’ Camp. This was further afield. Kensington Gardens is much bigger than I had realised. We sat down for a bit and pondered and enjoyed it. It was a lovely sunny afternoon and we could hardly hear any traffic at all, even though a road crosses the Gardens, which allows traffic in the daytime. There were blackberries growing in the hedge, birds flitting about and wildlife on the Long Water. The Long Water is part of the Serpentine, a man-made lake. In the Serpentine half, you can go boating, while in the Long Water, there are herons and swans. I noticed in the book that there is a reference to the place being quite wild in the time of Barrie. Well, the sheep may have gone, but the long grass remains, although carefully restrained by borders of the mown stuff between it and the paths. Also, the little stone markers are still there, used for marking the boundaries between the parishes. Finally, we summoned up the energy to set off again. The Lost Boys’ Home was distinguished by a surge of boys dancing around a tree emitting various whoops and war cries. Every now and again, we could see one breaking away from the pack to fire arrows into the grass. Some came alarmingly close to us. I didn’t take a picture, which I regret now, but it didn’t seem all that photogenic at the time. It would have been good to film it, I think, to convey the movements and sounds. They looked as though they were having a lot of fun. At this point, we left the Gardens. Our plan was to head off to see one or two of the houses mentioned in the book, so we headed to the main street where a taxi appeared and just like in the movies (though not Dean Corso in Paris!) I hailed it successfully. The driver took us to 23 Campden Hill Square. This address does exactly what it says in the name. It is a square on a hill, with the house being at the top end looking downhill. In the middle of the square is a garden full of shrubbery. It is a lovely Georgian building labelled with a blue plaque identifying its significance. However, it is labelled as being the home of Siegfried Sassoon, one of our ‘war poets’ from World War 1. Information about the square is provided in plaque attached to the garden ralings, which I have included here. "Camden Hill Square was laid out by Joshua Flesher Hanson in 1826. Gates and most of the railings around the central garden are original but building sites were let or sold piecemeal. The first house occupied was No. 2 in 1828. The other early houses which remain were completed at various dates up to 1842." Of course, we were completely worn out by this stage and asked the driver to take us somewhere decent for refreshments. This was a café in South Kensington, adorned by a wall full of pictures of Princess Diana, where we sat and watched the world go by. 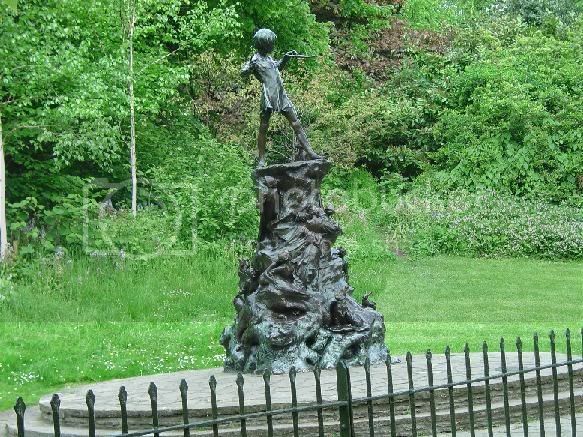 It was at this point that we realised that we hadn’t yet seen the statue of Peter Pan and to return home without doing so was intolerable, so back we went, along the street and across the Gardens. By this time, it was late afternoon, with a fair number of joggers moving along the paths, along with various characters from the story. Eventually, by this time moving at a snail’s pace, we found the statue. It is in a fine position, overlooking the Long Water. What didn’t we do? We missed Tiger Lily’s Camp completely, for some reason, but were compensated by the spectacle of some wigwams nestling next to the Albert Memorial. Completely incongruous! These proved to belong to the Evening Standard, one of the sponsors of the event. Also, we didn’t dress up. I am normally the type to do just that but it required more preparation than I had time for, at this particular time. It was a very enjoyable day, though. It was good to see the little ones have so much fun. I also found myself imagining J. M. Barrie and the boys in various places in the Gardens and Campden Hill Square. The scenes were quite evocative in that respect and have certainly helped me to become more involved with the book. DITHOT note: This event was a charity fundraising event for the Greater Ormond Street Hospital. It looks like it was great fun! Many thanks to SueC and her sidekick Suse for their excellent work in the field on behalf of our UK Bureau. We look forward to more “on the scene” reports in the future! Last edited by DeppInTheHeartOfTexas on Wed Aug 04, 2004 7:02 pm, edited 1 time in total. Thanks to SueC, her friend, and the UK bureau for this excellent report. It really makes reading the books here on ONBC more fun when there are pics and adventures to add to it. I was in Kensington Gardens when I last visited London and it is beautiful. To think Princess Di lived there and had that as a 'yard' is something. Hurray to the UK zoners!! Great job! Glad that a fun time was had by all. I just want to thank you, Suec, in person, as it were, for all your efforts tracking down information, taking amazing photos, and writing up these reports. Your reporting is such that I feel like I’m right there with you experiencing the whole thing. Very entertaining, too. Wonderful report, Suec. Thank you. I know you were wondering if you'd be up to the task, but I think you've proved beyond doubt that you're more than up to it. Hope your back's been okay. Looking forward to more reports if there are any coming up. Maybe this could be a regular feature of the ONBC any time one of us is based near, or travelling to, an area connected with one of the books we're reading. It definitely adds another dimension. It certainly does add another dimension, Sands. I have much more of an emotional attachment to the people in this book as a result of my travels. I think your suggestion about any one of us doing this is an excellent one. I would whole heartedly recommend it. It would never have occurred to me to do anything at all if it hadn't have been for the OTR tour, so this is yet another instance of the ripple effect of Johnny's impact. Liz, you are welcome! I'm glad you like the report. It was a lovely day. I didn't track down much information, though. It was given to me in an e-mail. Thank you for the suggestion. You guys rock! I definitely adds another dimension. Having done one of the OTR tours myself, I can tell you that it really gets you into the book and the author. We are always grateful for the things our posters bring! Anytime we can get a "live" report from the field I think it is wonderful! It really does bring another dimension to the story. Like seeing the locations where Johnny has filmed a movie give you a new perspective on a film. Please let us know if you ever have a contribution to make! Well done! I don't know what I can add to what already has been said. the photos and the story are awesome! Thanks so much for doing this for us! Looks like a great time! Is this an annual event or a one-time thing? I'd certainly love to do something similar if I get the chance. I'd love to have visited Kirriemuir, the Scottish village where Barrie grew up, which is about a hundred miles from me, on the other side of the Grampian Mountains. Unfortunately though, I'm in the process of getting ready to move house and also packing my daughter off to college and things are pretty hectic, so I don't think I'm going to get the chance before I move. I'm moving down to Wales, so if anyone ever comes up with a book that has a connection to Johnny and Wales I'll see what I can do! Pamela wrote: Looks like a great time! Is this an annual event or a one-time thing? was no mention of other fund-raising evets in the publicity.